We called up James Ross, the state Department of Labor's labor market analyst for the Capital Region, to get some perspective on the local jobs picture. The unemployment rate in the Capital Region this past April was down a lot from the April before, but there were fewer people employed overall. That's kind of confusing, so what's up? How does that work? The labor force statistics, the unemployment rate data, is not designed to be a time series. It's designed to be a comparative series. So to compare the Albany area to the nation or to the state or the Buffalo area -- during the same time period. So it's really kind of difficult to use it as a time series to say, oh, look the labor force dropped. Now, nationally the [the size of] the labor force is declining, statewide it is going down. And there are a few reasons for that. 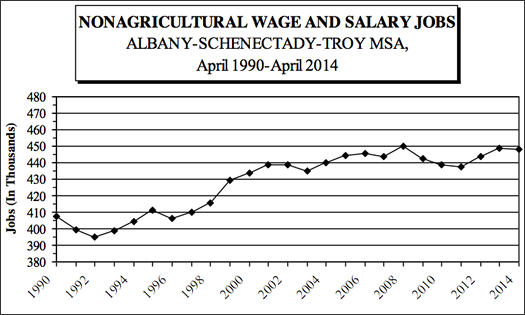 But I think the degree to which it dropped in the Albany-Schenectady-Troy area [for April] is probably because of statistical methodology rather than any real economic changes. The labor force is declining, for two reasons. One is the overall weakness in the economy which continues and so people are tending to drop out of the labor force, they feel like they can't find a job. That's becoming less and less the case. In the early part of the recession, that was the primary reason people were leaving the labor force. Numbers via Census Bureau American Community Survey 2012 3 yr estimates. More recently, [the reason] is more structural, and that's the aging of the baby boom population. 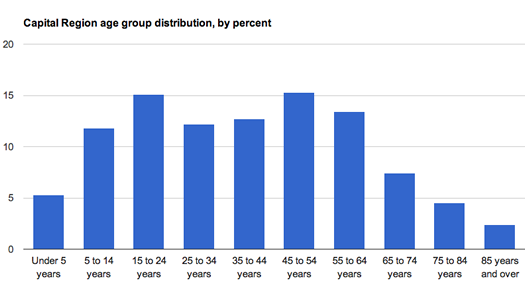 The middle of the baby boom generation is now in their late 50s, so we already have some people hitting 65. But labor force participation rates tend to drop after people hit 55. So with a larger and larger portion of the labor force in that larger age cohort, which typically has lower participation rates, it's pulling the rates down across the entire economy. Over the years we've seen the participation rates of women rising as it hits each new age cohort. It started in the late 1960s and you can see the participation rates go up in youth and then staying there, and then each five years you can see that cohort going up as well. Well, now those people are all in the labor force as well -- so the participation rate of women, which had been growing pretty dramatically, has leveled off because there are no more age cohorts for it. The participation rates for men have been declining for years. ... The participation rate of youth has also dropped over the years. Part of that is them staying in school longer. In some cases kids not wanting to go into the workforce when they're teenagers, wanting to do other activities, whether it's volunteer work or other things. So, you mentioned there are these two issues -- the recession and then this more structural, demographic issue -- to what degree can those be pulled apart so we know how much it is of each? That's been the big question. There's been a number of studies done and the percentages range from anywhere from 50 percent being demographic to maybe a third being demographic. It depends on the time period you're looking at. The latest study I had seen, in their examination in the early part of the recession most of the decline in the labor force was due to people who are exiting because of the economy -- they didn't feel like the could find a job, they gave up their search. And then there were people who had already retired -- because the 401ks, their pensions, had suffered -- they were actually coming back into the market because suddenly their investments weren't going to get them through retirement. Once the market came back, and those retirement plans were a little more robust, then people started leaving the labor force again, and a lot of people who had postponed retirements decided, OK, now I can go. So again, the early part of the recession was more due to the economy, the latter years have been more about the structural change. But there are no hard numbers on what those shares are. This like a square pie chart of the Albany metro area's nonfarm jobs, and how they're distributed by industry, for April 2014 (click for a larger view). Numbers via NYS DOL. What is the jobs picture in the Capital Region right now, what's growing, what's losing? We're continuing to see losses over the past year, government's down 1,000 jobs -- 200 in federal, 300 in state, 500 in local, most of that in local education, which was down 400. If there was one thing that labor market analysts, like yourself, would like to know about the current situation, but just don't have the numbers or don't quite know how to know that, what it would be? I guess it would be good to know what are the individual jobs that people are going back to. We have the industries that they're going back to, and we have some occupational information, but it would be useful to know exactly what jobs people are returning to. Are they equivalent to where layoffs were occurring? Like, for example, you were working for a company as a secretary and they cut a bunch of secretarial jobs, are you going back to work as a secretary or in some other sort of job? Right. Or, where is the growth in a industry? If finance was cutting, maybe people who were being laid off were in lower level positions, but now the growth is in higher level positions. It'd be good to know how that's being played out.